Except it’s not a movie theater, as I realized when I got out to take a closer look – it’s actually a branch of the Barnes & Noble off-shoot Bookstar. Was this just a faux movie theater facade designed to appeal to out-of-towners like me? Had I already been duped on my first day of scouting?? Nope – it’s the real thing. This was once the Fox Studio City Theatre, which opened in 1938 with seating for 880 (the above picture was taken shortly before its premiere screening). A classic example of the streamline moderne style, it was designed by architect Clifford A. Balch, who was also responsible for more than twenty art deco theaters throughout southern California, including the El Rey. In the first episode of the 1968 season, Joe Friday and Bill Gannon head to the Fox Studio City Theatre to investigate a bizarre acid-pouring crime, and we get a view of its exterior once more, now restored to its original design. Sadly, unable to compete with nearby multiplexes, the single screen theater finally closed its doors in 1991, and was soon after converted into a bookstore. …and you’ll find yourself inside the ghost of the old Fox Studio City Theatre, which has been left surprisingly untouched. Thought quite skinny by modern standards, it was originally set up to handle 70mm projections. In its heyday, the theater rented out its two front wings for retail (in the episode of Dragnet, it was apparently occupied by a clothing store called Isabelle’s). When the movie theater closed, the owners, the Rothman family, were adamant that as much of the original structure be preserved as possible. You know a theater has been lovingly converted when you could still mistake it for its original purpose. It’s as majestic as ever. If you enjoyed reading this post, would you consider making a donation to help me make my first movie? The goal is $50,000, and already, 1,701 generous readers have donated $35,874.00. Just $5 or $10 can make a difference - AND you get a snazzy Scouting NY sticker or magnet as a Thank-You gift! Click here to donate today! And hey, if you've made it this far, why not follow us via RSS, Twitter, Facebook, or Tumblr? Nice work, dude. Welcome to Los Angeles. Houston used to have a movie-theater-turned-bookstore also, though it’s been turned into a Trader Joe’s now. So nice to see how much of the original theatre is still around! BookStar did the same in San Diego, at the historical Loma Theatre in Point Loma. I saw ET and Top Gun there as a kid, and a few years later it was converted. The remodel included additions to the building, but the original marquee remained. That is incredible! Welcome to California! I hope you will be scouting the state as you did in New York. Our state is a bit larger, and you will find every land form on earth except for four here. Start looking! It’s real! I thought that you were joking with the ScoutingLa site. So glad it is real. Really liked your NY site — it almost made me want to go back east for a visit. (Haven’t been any rush to return east since I left in 1966). I hope you find lots of interesting things in LA (and the rest of California?) This story is a great start. Yes! Welcome to Los Angeles! I’ve been an avid reader of Scouting NY for years. Never thought you’d ever end up in the west coast. This is really exciting! Los Angeles has a habit of covering up its past. As you’ll soon find out, there is so much to be uncovered. My theory is that the film industry has provided a sense of non-permanence. What was once the original Disney studios is now a grocery store. The west coast operations for NBC is now a Walgreens (formerly a Borders). Los Angeles is beginning to take note of its past, but it has a long way to go to uncover everything. Speaking of which, if you ever make it up to Palo Alto, the former Varsity Theatre was a Borders. Similarly to the B&N in Studio City, much of the theater was preserved when it was converted to a bookstore. Not sure what became of it once Borders vacated. Anyway. Yay! You’re in L.A.! I’m looking forward to your stories about a city I live in! Well as a former New Yorker watching from my current vantage point in Des Moines, I’ll begrugdingly continue to follow your adventures in LA since you’ve still got one of coolest blogs around. Maybe with your help, I’ll take a little more shine to LA, and recover from the virtual voyeuristic loss of leading me around good ‘ol NYC. Great job on the new LA site. Love this post. Weirdly enough I just saw mention of this theatre/book store on Imgur in the last few days. Very strange. I’ll miss the New York posts but will continue to follow the LA blog since I really enjoy your style of presentation. All the best from Nova Scotia, Canada. But will you be able to find the Spider Pool? 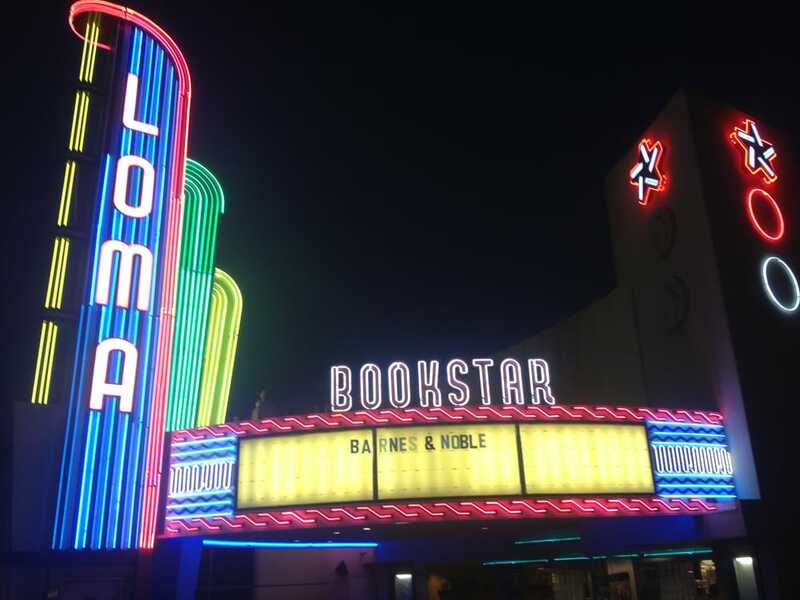 I was going to mention my local Bookstar in San Diego (formerly the Loma Theater) too, but Ara beat me to it! My kids love running down the sloping aisles toward what would have been the screen (and is now the children’s books section). Welcome to California! I too will miss your New York posts (I live on long island a half hour train ride into Manhattan) they were the best, and I made an effort to visit many of the places you mentioned. But that being said I will now look forward to your California posts . thank you for making the effort to continue this wonderful journey in over looked architecture. Seems to me that bookstore owners would be reasonably respectful of movie theaters. It’s all intellectual property of a sort, and unless the bookstore is just into “Literature”, a theater would be a great fit. Lots of old movie theaters here in Brooklyn are now serving as retail or banking spaces. Very few have retained much, if any, of their movie theater glory (unless it’s only been covered over). I didn’t think you were going to be able to find as much cool stuff in L.A. as you did in New York. It has only been about a week and you have done it again! I guess your scouting skills travel with you, like an angry poltergeist. Very nice. Ah, LA. We tear down everything with impunity (do NOT get me started on the 1920s/1930s redevelopment of downtown), yet we like to repurpose old theaters (I guess we think we’re showing some respect to the industry that built our city?). I’ve seen them turned into churches, stores, and perhaps most famously, the old United Artists theater is now an Ace Hotel. Welcome to the west coast! I’ll miss your NY adventures. As you explore your new home..be sure to visit Riverside and the Mission Inn Hotel..near by is a Julia Morgan building and an endangered mid century library building. Riverside was once the Palm Springs of California…the city is doing its best to erase what remains of its architectural history and legacy…downtown is worth a bit of exploration. 2) Congrats on the move….should only take you about 12 years to cover the area…..before you flit-off to Scouting Paris, or some such. 3) Hope we have some stories/pics built up for future posts about the move…..ALWAYS a fun time! 5) Also looking forward to blasting you for throwing your weather in our faces come winter……how COULD you not take us with you??? Please go back and finish this tour: we need to see the projection room, dang it. My name is Nick Carr. I work as a movie location scout. My job is to stare at the city. This is what I see. To contact me for location scouting services or any other request in New York, Los Angeles, or beyond, email me at nycscout@gmail.com or visit nickcarr.com for more information. I'm also available for speaking engagements discussing my work as a scout and my explorations throughout New York City (accompanied by hundreds of photos, of course!). Click here for more info. Help Scout Make His First Movie! Donate $10 or more and you receive this Scouting NY sticker as a Thank You gift! Click here to donate today! 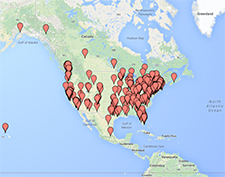 Click the map below to see where Scouting NY readers have donated from!